What Is Another Name for Somatic Stem Cells and What Do They Do? Cellular biologists grow cells in their laboratory to unlock the secrets of normal and abnormal cell activity. Cells from humans, animals, plants and micro-organisms are isolated and cultivated to develop cell lines for research studies. Many types of cell line studies have great application to the field of medical science. For instance, cell lines are used to investigate genetic mutations, cancer treatments, drug screening, aging, metabolism and vaccines. What Is a Cell Culture? Laboratory researchers culture large populations of cells from one or more parent cells. A cell culture originates from cells of a primary tissue donor or from a cell line purchased through a cell biobank. Cultured cells proliferate in a growth medium under carefully regulated conditions. Cell cultures are invaluable in diagnosing infections and abnormalities, testing new drugs and studying diseases like cancer, according to the National Cancer Institute. Scientists carefully study cells cultured from humans, animals, plants, bacteria and yeast. Some cell cultures possess the ability to divide indefinitely. Primary cultures are cells isolated from tissue and grown until the cells reach maximum capacity (confluence) for their container. Cells are then transferred to a secondary vessel containing fresh medium to encourage continued cell multiplication. Each cell replication increases the odds of mitotic error and exposure to contamination. The process is similar to aging. Most cells can only replicate so many times before they die off naturally or enter a period of resting called senescence. Cell lines comprised of mortal cells that can't live forever are referred to as finite cell lines. Some cells spontaneously acquire the ability to multiply indefinitely. In the lab, immortality can be induced by transforming cells chemically or with viruses. Populations of immortal cells are known as continuous cell lines. Most finite and continuous cell lines are anchorage-dependent, meaning their existence depends on nutrient-rich substrates, gasses, enzymes, correct pH and suitable temperature. Care must be taken to protect finite and continuous cell lines from infection and gene instability that can occur with multiple transfers. The problem can be rectified by cryogenic storage. Freezing cells with liquid nitrogen requires steady monitoring of temperature and backup refrigeration in the event of power outages or equipment breakages. What Is a Cell Line? Subcultured cells taken from a primary culture start a cell line. Unless otherwise altered, normal cells from a primary culture have a programmed life span, meaning they are finite. The strongest, fastest growing cells predominate and give rise to uniformity in the population. Each transfer is called a passage. 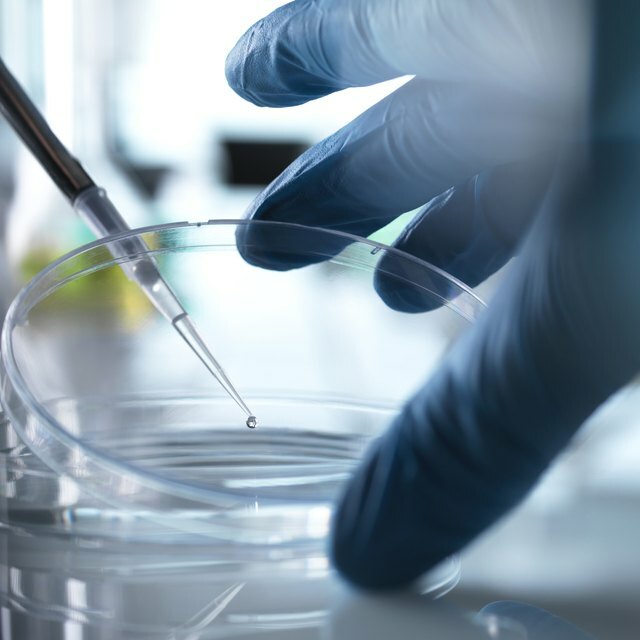 Stem cell lines are highly revered by researchers because a stem cell has the power to replicate itself or differentiate into many types of specialized cells such as neurons or osteocytes. Stem cells repair damaged tissues and regenerate missing limbs in some species. Stem cell studies could lead to advances in the treatment of common diseases such as coronary disease and diabetes. However, there is still much to learn in the field of regenerative medicine, according to the National Institutes of Health. Cell strains are subpopulations of a cell line. Cell strains derive from cells that were removed from the cell line and genetically altered through cloning or transmission of a virus, for instance. A cell strain can also result from contamination during the transfer process. Oldest Cell Line in U.S.
HeLa cells are the oldest cell line in the United States, according to the John Hopkins Medicine website. HeLa cells are named after Henrietta Lacks, a mother of five children who died in 1951 at the age of 31 from an aggressive form of cervical cancer. Doctors at the John Hopkins Hospital were startled at how fast Henrietta’s biopsied tumor grew in the lab. Wildly growing tumorous HeLa cells make them well suited for testing the effects of experimental drugs on cancer cells before clinical trials on humans. HeLa cell studies have led to many groundbreaking discoveries. Remarkably, this cell line is still used today in research laboratories worldwide. Cancer cell lines with tumors and genetic mutations offer important insight into how changes to genes occur and progress. Learning more about the genesis of tumors can suggest improved drug treatments and recommended lifestyle changes. For instance, mutations of the RAS gene are seen cancers of the colon, pancreas, bladder and ovaries that don’t respond well to EGFR-inhibiting drugs. Culturing cell lines with the RAS gene mutation would provide a model for testing alternative drug treatments. Isogenic cell lines are engineered in the lab by inserting a gene into a sample of cells isolated from a cell line. The engineered cells are then compared with cells derived directly from the parent cell, which acts as the control group. For instance, Clustered Regularly Interspaced Short Palindromic Repeat (CRISPR) gene-editing tools can create isogenic cell lines of oncogenes for use in testing new cancer-fighting drugs. Studies using isogenic cell lines also offers insight into how genotype influences phenotype. Careful consideration goes into selecting the most appropriate type of cell line for a planned study. The purpose of the experiment should be a driving factor in selection of cell type. For instance, liver cells are a good choice when studying toxicity. Continuous cell lines are easier to maintain long term. Cells growing in a flask or culture dish spread across the nutrient medium of their container, eventually covering the surface, which is called confluence. Cell biologists often note the level of confluence that was observed when reporting their findings. For example, 80 percent confluence indicates that about 80 percent of the surface is covered by cells. Cells are typically transferred before reaching 100 percent confluence to keep them actively growing. However, immortalized cells may keep dividing and forming layers. Growth rate of cell lines vary by type. Contamination of cultured cell lines is a serious problem in medical research. A 2015 article in Science quoted geneticist Christopher Korch as saying, “…tens of of thousands of publications, millions of journal citations and potentially hundreds of millions of research dollars” are connected to studies using misidentified cell lines. Efforts are underway to expose commonly used cell lines that contain other types of cells. Examples of egregious errors include mistaking the cells of pigs or rats for human cells and not disclosing the mix-up when reporting findings of the study. Many human cell lines are also believed to be contaminated with fast-growing HeLa cells, which outpace other dividing cells if contact inadvertently occurs. Groups like the International Cell Line Authentication Committee are working to correct the situation by requiring specimen identity checking when launching a study. Dr. Mary Dowd studied biology in college where she worked as a lab assistant and tutored grateful students who didn't share her love of science. Her work history includes working as a naturalist in Minnesota and Wisconsin and presenting interactive science programs to groups of all ages. She enjoys writing online articles sharing information about science and education. Currently, Dr. Dowd is a dean of students at a mid-sized university. Mary, Dr.. "Types of Cell Lines." Sciencing, https://sciencing.com/types-cell-lines-6877588.html. 15 April 2019.